The games I most enjoy playing are the ones that can inspire players’ imagination with a story that unfolds over the course of a session. Quality and consistent artwork, thematic gameplay, and resonance with the audience’s pop-culture experiences are all elements through which a game can deliver a story experience in which the players feel they are a part of the fictional world where the game takes place. Role-playing games like Dungeons & Dragons and Pathfinder are the most straightforward example of this, where the whole point of playing is investing in a character you’ve created and seeing the world through their eyes, but simpler games can accomplish the same thing. 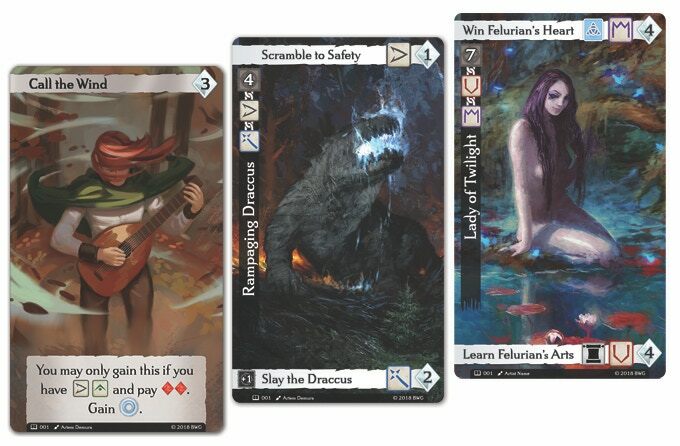 Brotherwise Games, the design duo behind the hit card game Boss Monster, aims to take the storycrafting aspect of role-playing games—and, well, story writing itself—and distill it into an easy-to-learn, tableau-building card game titled Call to Adventure, now available for backing on Kickstarter alone or with an expansion set based on Patrick Rothfuss’s fantasy novel The Name of the Wind. Story-minded geeks will likely recognize the title as a term coined by Joseph Campbell, author of The Hero with a Thousand Faces, and this is no accident, as the focus of Call to Adventure is the creation and development of characters undergoing the hero’s journey as they rise from humble origins, prove themselves through epic quests and trials, and fulfill a great destiny, forming a story in which both tragedy and triumph are equally valuable. In place of dice, players face challenges by first choosing from one of the two “paths” shown on a challenge card: avenues through which you will attempt to succeed at the challenge, for example, “At the Academy, will you excel in your studies, or build lifelong friendships?” Once the path is chosen, the player then casts plastic “stones” etched with runes appearing on cards they have acquired (a studious character might begin play with an Intelligence rune). Though players are technically competing to build the hero with the greatest destiny, as represented by the accumulation of tragedy and triumph points, I would not describe Call to Adventure as a competitive game, per se. Player interaction is limited, and elements of the game’s design remind me of Gloom by Atlas Games, a darkly humorous card game that derives much of its appeal and replayability from the stories that players craft verbally to explain the awful things happening to their characters. In much the same way, I see Call to Adventure being the type of game where, rather than simply defeating a monster and scoring its challenge card, the player will describe the circumstances in which their hero encountered the beast and the manner in which they conquered it. I usually try to keep my tone neutral when covering games still in development, but here it’s hard for me not to betray my enthusiasm—it would not be hyperbolic to say this is precisely the game I’ve been waiting years to see made. As the designers note in their initial update, there are plenty of fantasy games available today, and fans of the genre have myriad titles to choose from. But just as Patrick Rothfuss set out to write something different in The Name of the Wind, the brothers of Brotherwise wanted to draw less on the epic violence that makes up most tabletop games with a fantasy theme and more on the overarching story that explains who these heroes are and why they might find themselves hacking and slashing their way through a dungeon filled with goblins. 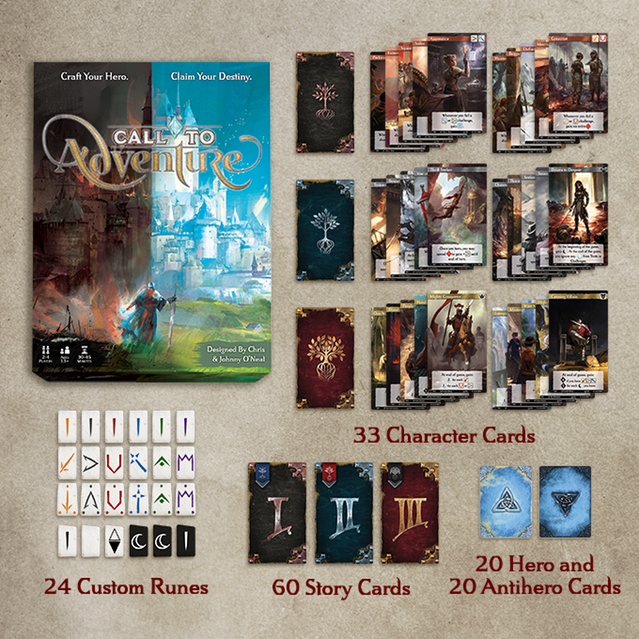 Call to Adventure‘s Kickstarter campaign blew through its base funding goal in a less than a day and has since reached several exciting stretch goals.